Had a really long day yesterday and however tired I was, I really enjoyed the trip to Shah Alam and KL. About 7 hours of bus ride two and fro did not ruin my mood to enjoy myself even when the ride was bumpy throughout the journey. All these I have no one to thank other than my fellow college mates who made my day. We departed from college at 6.30 a.m. and stopped for breakfast at Tapah rest area. As it was still early and I was saving my stomach for grilled fish in Midvalley later, I only had some curry puffs. They were delicious. Half an hour of break was more than enough for eating so we had ample time for toilet and erm, a time to reminisce our childhood. The see-saw! Even the lecturer's wife was having loads of fun. Look at Mickey Alfread enjoying it! I participated as well. I am glad I wasn't that heavy because I did not break the see-saw. We snapped more pictures at the rest area while waiting for the rest to get their stomachs filled and bladder emptied. Mickey has always been our source of entertainment in class. It's very fun to bully him! The journey was uneventful and the excitement began when we entered Bread Town! Everything looked very Egyptian to me and it was then that I realised that bread-making was first started by the Egyptians. The carvings on the wall depicting the Egyptians making bread were really awe-inspiring. That was the first thing I noticed when I entered the Bread Town. We entered a cinema-like room with a projector and screen right in front and waited for instruction. Then, one of the employees came and showed us a short presentation about the 5000 years of history in bread-making. I love the Georgian era the most. The next part of the tour was even more interesting. It's too bad we were prohibited from snapping photos inside the factory or else this post will be heavily loaded with them. After the tour, we were each given a bag of bread goodies to take home. We snapped more pictures at the entrance to the gallery. The giant High 5 bread loaf behind us. So we had ample time for shopping after that. Ate my favourite ikan bakar and then off to more strolling. Saw the Getha bed again and they have changed the bedding! It was already past 4 p.m. and as we were tired and thirsty, we stopped at Delifrance for a drink. This was what I ordered. Passion fruit (French Soda)- RM6.50. Before being stirred. After stirring it. Very refreshing. I got to eat a free cherry too. Took the KTM soon after to go to KLCC. I met one Malay lady in the train that was so rude and she nearly accused me for stepping on her daughter's food. Can't be bothered with rude people. I should remain as a civilized person and that's what I did. She must be thankful. It's a candid shot. Alfread, you still look like a Mickey Mouse to me. Posing with the RM2 water we bought in one of the kiosks in KLCC. Our trip will be carried out as planned I am going to enjoy myself and not let the bumpy ride ruin my mood. It will definitely be fun! The other day, my sister spotted L on the coconut tree. I was shocked and thought he ran away at first. 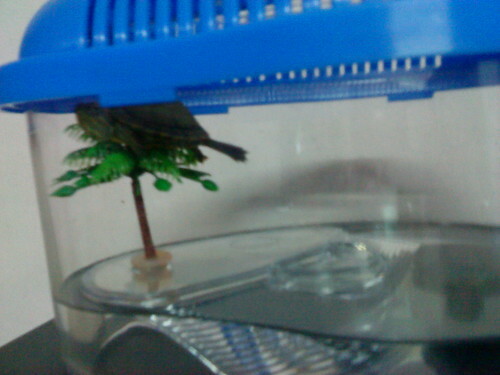 He can climb trees! Wow, a new found talent of his. 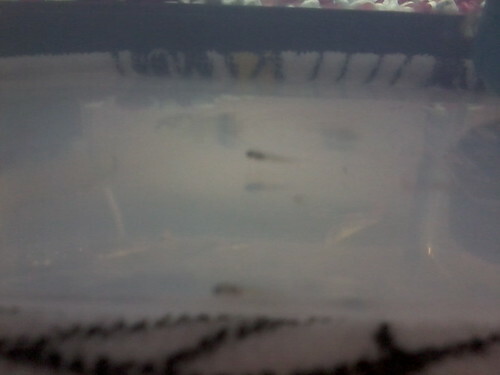 One of the female guppies gave birth today! 6 surviving ones. They are still very tiny. Alfread, one of them looks like you. So cute like mickey mouse!!! Will be keeping a close watch to see if any more are going to give birth to these cuties. I am so excited! It's a must try. 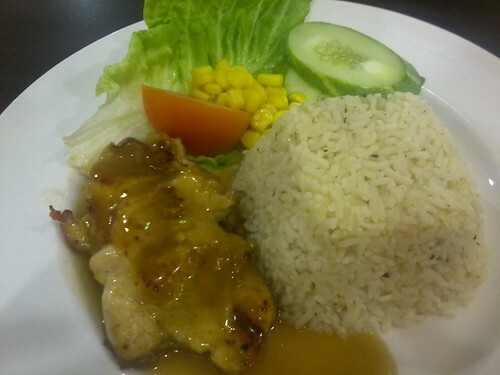 Onion rice with grilled chicken. Finally, the assignment season is over! Time to relax before the exam season starts. Next up: Lumut trip for some seafood products! 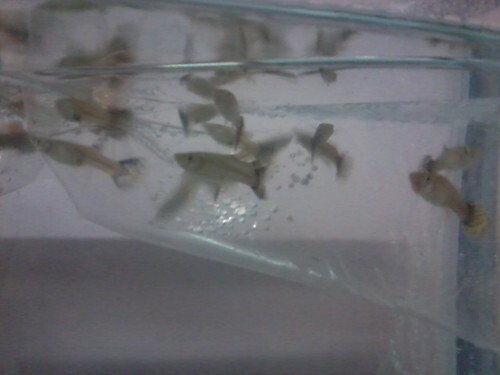 Female guppies still in the plastic before being released into the 'wild'. P.S. Saw a puffer fish at the night market too! Didn't know they can puff up out of the water. It was amazing! Paul the oracle octopus has spoken again! Okay, so Paul is afraid of his own life and death so he has decided to side Germany once again! According to some people, Paul tends to choose the box on the right but this has been proven wrong with the Germany-England match which he chose the left box. There are also others who said that Paul makes his choices by judging on which flag has more red in it. Looks like Paul loves red. What do you think? How does Paul choose his winning team? HAve you ever been to a durian party? I've been to one today! I still smelll durian right now. Ju Dee, Kah Men and Mickey, see what you have missed out! Look at the amount we ate! Try guessing how many there are. The schedule has changed and now I have classes from Monday to Thursday. Love it. The lecturers are good too. I pray that there will be no changes for this semester. It just feels really weird as though we are the source of the problem when lecturers are leaving one by one. Reminds me so much of Problem Child. Nobody wants to teach us. Someone brightened up my day today. Wei Li, I received your lovely postcard from Vienna. I know I can be lousy at keeping in touch and I was so lucky that you are doing it so well. Hope to see you soon! I might be in Penang when you touch Malaysian soil but I will always be 1.5 hours away. Haha! The weather was so warm today that I don't want to be in my room. I might consider sleeping in the living room tonight. Counting down to my training: About six more months to go. Hope I learn something.